Many of you know the physical side of addiction, but how many of you have thought that everything could be spiritual related? Description: The causes of addiction are not just based on a mental problem. Spiritual research indicates that often an addiction has its root cause in the spiritual dimension. This article is recommended reading for those individuals and their families that are struggling with addiction. 1 What is the modern science view of the causes of addictive behaviours? There is no consensus as to the aetiology (cause), prevention and treatment of addictive disorders. A United States government publication, ‘Theories on Drug Abuse: Selected Contemporary Perspectives,’ came up with no less than forty-three theories for chemical addiction and at least fifteen methods of treatment! As an example of this confusion consider that many people believe that addictive behaviours such as gambling and alcoholism are ‘diseases’. But others consider them to be behaviours learned in response to the complex interplay between heredity and environmental factors. Still others argue in favour of a genetic cause. Some researchers point out that, unlike most common diseases such as tuberculosis, which has a definite cause (a microbe) and a definite treatment model to which everyone agrees, there is no conclusive cause or definite treatment method to which everyone agrees for most types of addictive behaviours. Accordingly, although billions of dollars are budgeted to reduce addictions and substance abuse, there is no consensus on the cause of addictions. The Spiritual Science Research Foundation (SSRF) suggests that if the governments of the world were to focus on the spiritual causes and spiritual treatment of addictions in their research, they would have a greater amount of success in curbing addictions. 2.1 What does spiritual research into causes of addiction mean? Spiritual research into addiction means research into the spiritual causes and healing of addictions by means of an advanced and activated sixth sense (ESP). 2.2 Who can diagnose through spiritual research? Diagnosis of the specific spiritual cause of addictions is possible only by a spiritually evolved person who can perceive the subtle dimension. By spiritually evolved we mean a Saint i.e. one who has achieved the spiritual level of 70%. A person with an active sixth sense (ESP) can perceive the root cause, but if he or she has not attained a minimum of 60% spiritual level, the diagnosis must be verified by a spiritually evolved person (Saint) above 70% spiritual level. According to the Spiritual science, who can be considered a Saint? How does one conduct spiritual research? The scope of spiritual research on addictions conducted by SSRF encompasses all types of addictions. 2.4 What are the causes of addiction? The extent of the ‘known world’ as compared to the ‘subtle spiritual dimension’ is in the ratio of 1: infinity. Through spiritual research methodologies, we can look into the spiritual dimension and ascertain the extent to which it affects our lives. However it is pertinent to add that the subtleties and shades of the various spiritual factors and their interplay can be very complex and intricate. It is for this reason that one can at best document up to 80% of the contributing spiritual factors. However even with this limitation, just by taking the spiritual dimension into account, spiritual research is far more holistic than conventional research in getting to the bottom of why things happen. 1. The figures in this table are just averages and can vary considerably on a case by case basis. The important point is that there is a high likelihood of a spiritual influence currently unknown to modern science. 2. This aspect is due to the mind and ego. For example, due to peer-pressure or just to show off, a teenager may begin to use an addictive substance. This is often the case with smoking where the tendency is to give the impression that one is ‘cool’. 3. The proportion of spiritual causes of addiction can vary considerably. Even if the addiction initially is because of psychological reasons, negative energies can take advantage of this weakness in a person to affect them. Thus the addiction that may have started with a physical or psychological reason soon escalates into a spiritual one. Keeping this in mind it is therefore quite understandable when the Surgeon General (US) cited several national surveys that reveal 75% to 85% of the nation’s 51 million smokers would like to quit but have so far been unable to do so (Source: Time magazine). Addicts are unable to give up an addiction even if they want to because of the influence that the negative energy has over the addict. People with multiple addictions can either be influenced by multiple ghosts/departed ancestors or just one ghost/departed ancestor with multiple addictions. Relapse of addictive behaviour has been a very sore subject within the field of addiction. It is considered a sign of failure. Spiritual research shows that because the spiritual dimension is the root cause behind many addictions, this is one reason for the low success rates of treatments that are being conducted at a physical and psychological level. Physical treatment means rehabilitation involving quitting the substance and then treating the withdrawal with chemical medication. Chemicals like methadone are used as safer substitutes for the original abused substance. Psychological treatment includes counselling, formal and/or informal psychotherapy etc. with or without physical treatment. According to the spiritual Path of Action (Karmayoga), all our actions are either destined (not in our control) or due to free will (within our control). As a rule of thumb, in the current era 65% of our actions are destined and 35% are due to free will. However in the case of addictions, the proportion of the destined element is far greater. Major life events such as birth, marriage, major accidents and death are completely destined, i.e. the role of destiny is 100%. The actual proportion of the destined element in a particular addicted person can only be ascertained by individuals beyond the 70% spiritual level (i.e. Saints) or by those with very highly advanced sixth sense. Refer to the article “Spiritual root causes of difficulties in life”. WASHINGTON, Aug. 18 (AP) ? A mix of bacteria-killing viruses may be sprayed on cold cuts, wieners and sausages to combat common microbes that kill hundreds of people a year, federal health officials ruled Friday. The ruling, by the Food and Drug Administration, is the first approval of viruses as a food additive, said Andrew Zajac of the Office of Food Additive Safety at the agency. Treatments that use bacteriophages to attack harmful bacteria have been a part of folk medicine for hundreds of years in India and for decades in the former Soviet Union. The approved mix of six viruses is intended to be sprayed onto ready-to-eat meat and poultry products, including sliced ham and turkey, said John Vazzana, the president and chief executive of Intralytix, which developed the additive. The viruses, called bacteriophages, are meant to kill strains of the Listeria monocytogenes bacterium, the food agency said. The bacterium can cause a serious infection called listeriosis, primarily in pregnant women, newborns and adults with weakened immune systems. In the United States, an estimated 2,500 people become seriously ill with listeriosis each year, according to the federal Centers for Disease Control and Prevention. Of those, 500 die. Luncheon meats are particularly vulnerable to Listeria because after they are bought they are typically not cooked or reheated, which can kill harmful bacteria like Listeria, Mr. Zajac said. The preparation of bacteriophages – the name is from the Greek for ‘bacteria eater’ – attacks only strains of the Listeria bacterium and not human or plant cells, the food agency said. “As long as it used in accordance with the regulations, we have concluded it’s safe,” Mr. Zajac said. People normally come into contact with bacteriophages through food, water and the environment, and they are found in our digestive tracts, the agency said. Consumers will not be aware which meat and poultry products have been treated with the spray, Mr. Zajac said. The Department of Agriculture will regulate the actual use of the product. The viruses are grown in a preparation of the very bacteria they kill, and then purified. The food agency had concerns that the virus preparation could contain toxic residues from the bacteria, but testing did not reveal residues, which in small quantities are not likely to cause health problems anyway, the agency said. Intralytix, based in Baltimore, first petitioned the food agency in 2002 to allow the viruses to be used as an additive. It has since licensed the product to a multinational company, which intends to market it worldwide, Mr. Vazzana said. Food companies remain wary of pushing the technology – which is named for the nanometer, or a billionth of a meter – too far and too fast for safety-conscious consumers. But they are tantalized by nanotechnology’s capacity to create valuable and sometimes novel forms of everyday substances, like food ingredients and packaging materials, simply by reducing them to sizes that once seemed unimaginable. “Lack of evidence of harm should not be a proxy for reasonable certainty of safety,” the Consumers Union said in testimony submitted to the F.D.A. for today’s meeting. The language was carefully chosen. “Reasonable certainty of safety” is what food companies must demonstrate to the F.D.A. before they can introduce a new food additive. The desire to avoid controversy has made even the largest food companies, like Kraft Foods, leery about discussing their interest in nanotechnology. Kraft, the second-largest food processor after Nestle, was considered the industry’s nanotechnology pacesetter in 2000. That is when it announced the founding of an international alliance of academic researchers and experts at government labs to pursue basic research in nanotechnology sponsored by Kraft. The Nanotek Consortium, as Kraft called the group, produced a number of patents for the company, but Kraft pulled back from its high-profile connection with nanotechnology two years ago. Manuel Marquez, the research chemist Kraft appointed to organize the consortium, moved to Philip Morris USA, a sister subsidiary of Altria that now sponsors the consortium under a new name – the Interdisciplinary Network of Emerging Science and Technologies. BETHESDA, Md. — The growing number of cosmetics, drugs other products made using nanotechnology need more attention from U.S. regulators to make sure they are safe for humans and the planet, consumer and environmental groups told a government hearing Tuesday. Nanotechnology is the design and use of particles as small as one-billionth of a meter. A human hair, by contrast, is about 80,000 nanometers across. Materials at nano-size can have completely different properties from larger versions, such as unusual strength or the ability to conduct electricity. Witnesses at a meeting called by the U.S. Food and Drug Administration agreed nanotechnology holds promise for a vast range of products, including new medicines to treat diseases or delivery systems to get drugs to body parts now hard to reach. But some complained that dozens of cosmetics and a handful of drugs made with nanomaterials already have made it to the market while regulators have done little to track their use or safety. “Unfortunately, so far the U.S. government has acted as a cheerleader, not a regulator, in addressing the nanotech revolution. Health and environmental effects have taken a back seat,” said Kathy Jo Wetter of ETC Group, an organization that tracks the impact of new technologies. The FDA has treated products made with nanotechnology the same way it handles others. For drugs with nanomaterials, that means companies must provide evidence of safety and effectiveness before they reach the market. But cosmetics, foods and dietary supplements are not subject to FDA oversight before they are sold — with or without nanoparticles. While no harm has been documented, concerns have arisen that the tiny particles are unpredictable and could have unforeseen impacts in the human body or in the environment. As they called for close FDA oversight, many experts said they felt the agency was ill-equipped to regulate the new technology in the midst of other responsibilities. “New nano-enabled drugs and medical devices … place burdens on an oversight agency that is already stretched extremely thin,” said David Rejeski, director of the Project on Emerging Nanotechnologies, a group aimed at helping society anticipate and manage effects of nanotechnology. The FDA has created an internal task force on nanotechnology, and officials said they called the meeting to learn what scientific issues the agency should address. The task force is due to report to the commissioner in nine months, said Dr. Randall Lutter, FDA’s associate commissioner for policy and planning. “It’s not only the risks, it’s also looking at the potential. There’s a lot of opportunity… to bring great things to patients,” he said at the meeting. Industry groups and some other experts urged the agency not to overreact. “The key is to manage the risk while achieving the maximum benefit from these materials. It would be wrong for us to over-regulate,” said Martin Philbert of the University of Michigan School of Public Health. 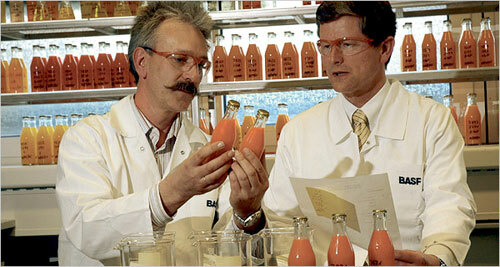 assess drinks that were made with synthetic beta-carotene, a nanoparticle used to add color and health benefits. F.D.A. officials said last week that treating every new nanotechnology product that consumers swallow as a food additive might compromise the agency’s mandate to foster innovation and might not be within its authority. Such a move would also be hobbled by the lack of agreement on safety testing standards for the wide range of nanoscale innovations in the pipeline. In addition, the agency lacks the staff to handle that scale of oversight. I write to express my serious concerns about the FDA’s regulatory oversight of nanomaterials in consumer products. Many consumer products containing engineered nanomaterials are already available on U.S. market shelves, including food and food packaging products. Millions of dollars are being spent by government and industry to apply nanotechnology in areas of food processing, food packaging, and agricultural production. Current nano-food products on the market include a canola oil, a chocolate “slim” shake, a nano-bread, and several nano-food additives and supplements used in soft drinks, lemonades, fruit juices, and margarines. Many food packaging products use nano-composites, nano-clays, and nano-coatings. In addition, if industry observers are correct, hundreds of more new food and agriculture products are under development and many could be on the market in as few as two years. By 2010 the nano-food market will be $20 billion. Many of the world’s leading food companies – including H.J. Heinz, Nestle, Hershey, Unilever, and Kraft – are investing heavily in nanotechnology applications. Scientists have found that the fundamental properties of matter can change at the nano-scale, creating physical and chemical properties distinct from those of the same material in bulk form. We know that the new properties of nanomaterials create new risks, like enhanced toxicity. Studies have raised numerous red flags, and many types of nanoparticles have proven to be toxic to human tissue and cells. Nanoparticles can gain assess to the blood stream following ingestion. Once inside the body, the super-tiny size of these materials gives them unprecedented mobility and access to the human body; they can access cells, tissues, and organs that larger particles cannot. The length of time that nanoparticles remain in organs and what dose may cause harmful effects remains unknown. It does not appear that FDA is ready for this wave of nano-food products. I am very concerned about the rapid introduction of these potentially hazardous nanomaterials into our bodies and into our environment without adequate scientific study to ensure that we understand their risks and can prevent harm occurring to people and the environment. The FDA’s failure to undertake or review new testing of these nanomaterials despite these known and foreseeable dangers suggests the agency’s review process is not acting to ensure consumer health and safety. For these reasons, I strongly request that FDA use its upcoming Public Meeting and its new Nanotechnology Task Force to discuss the human health and environmental risks presented by nanomaterials in consumer products, including food and food packaging products. FDA should act quickly to shore up its regulation of these substances to account for their fundamentally different properties and their associated dangers, including require new nano-specific testing and the labeling of all nanomaterial products, including nano-food products. Currently, FDA’s reliance on manufacturers’ assurances of safety make me and my family into guinea pigs. FDA must instead independently review all testing and assess the safety of these products as well as force manufacturers to label their nanomaterial products. Only with labeling can I make educated decisions about what I buy and put in and on my body. Until such actions are taken, I fully support a moratorium on the manufacture of nanomaterial consumer products and the recall of products currently on the market. A former FDA deputy commissioner for policy has denounced the agency’s capacity to properly regulate nanotechnology products including supplements, a criticism that could inflame debate leading up to the agency’s first major public meeting on the atomic technology. In a report commissioned by the Woodrow Wilson Center’s project on emerging nanotechnologies, University of Maryland School of Medicine professor Michael Taylor concluded the US Food & Drug Administration’s resource base is severely eroded. This is despite what appears to be a recent nanotechnology policy kick-start at the FDA. The report reveals regulatory weaknesses affecting new products, such as certain dietary supplements and cosmetics, using the technology. Critics say questions over nanotechnology safety have not been answered and the FDA is not in a position to effectively police it. “Unless the FDA addresses potential nanotechnology risks now, public confidence in a host of valuable nanotechnology-based products could be undermined,” wrote Taylor, who was deputy commissioner for policy at the Food and Drug Administration from 1991 to 1994 and currently conducts research on policy, resource, and institutional issues affecting public health agencies. Nanotechnology is the ability to control things at an atomic and molecular scale of between one and 100 nanometers and has been met with enthusiasm across a variety of industries. Critics highlight the murky area of how nanoparticles affect toxicity and say the particles should be treated as new, potentially harmful materials and tested for safety accordingly. Unlike pharmaceuticals, which must go through a series of pre-market approvals, finished dietary supplements need no pre-market approval. Under the Dietary Supplement Health and Education Act (DSHEA), which is part of the Food and Cosmetics Act, only ingredients not marketed in the US before October 1994 must be approved by FDA before use in consumer products. Thus, as it stands, pre-market regulation of nanotechnology in dietary supplements does not fall under FDA’s regulatory umbrella, nor – according to Taylor – can it fit into the agency’s budget. But Taylor points out in the report that the FDA is restricted in what it can do due to a dire lack of funding under the current administration. In order to continue activities mandated in 1996, FDA’s 2006 budget would have to increase by 49 percent, according to Taylor, and under President Bush’s 2007 FDA budget this funding gap will grow to 56 percent. “But FDA’s lack of ‘nano-readiness’ is about more than dollars,” said Taylor. “Business and health leaders alike should join in ensuring that FDA has the scientific tools and knowledge it needs to say ‘yes’ to safe and effective new products,” said Taylor. The market stands to benefit from nanotechnology and therefore also stands to lose a lot, according to Taylor, if it is not thoroughly regulated. In 2005, nanotechnology was incorporated into more than $30bn in manufactured goods, according to Lux Research, almost double the previous year. The market analyst projects that by 2014, 15 percent of all global manufactured goods will incorporate nanotechnology. The Washington, DC-based Woodrow Wilson International Center for Scholars initiated its project on emerging nanotechnologies in 2005 with the aim of helping business, government and the public manage possible implications of the technology. FDA’s nanotechnology public meeting will take place October 10, 2006 in Bethesda, Maryland. According to FDA, the purpose of the meeting is to help the agency in its understanding of developments in nanotechnology materials relating to FDA-regulated products. “FDA is interested in learning about the kinds of new nanotechnology material products under development in the areas of foods (including dietary supplements), food and color additives, animal feeds, cosmetics, drugs and biologics, and medical devices…” states an online FDA notice for the upcoming meeting. The United States is the world leader in nanotechnology — the newly blossoming science of making incredibly small materials and devices — but is not paying enough attention to the environmental, health and safety risks posed by nanoscale products, says a report released yesterday by the independent National Research Council. If federal officials, business leaders and others do not devise a plan to fill the gaps in their knowledge of nanotech safety, the report warns, the field’s great promise could evaporate in a cloud of public mistrust. The 176-page report, “A Matter of Size,” was prepared under the auspices of the National Academies, chartered to advise Congress on matters of science. It focuses on the National Nanotechnology Initiative, which coordinates and prioritizes federal research in nanotechnology — the fledgling but potentially revolutionary science that deals with materials as small as a billionth of a meter. At that size, even conventional substances behave in unconventional ways. Some materials that do not conduct electricity or are fragile, for example, are excellent conductors and are extremely strong when made small enough. But nanoparticles can also enter human cells and trigger chemical reactions in soil, interfering with biological and ecological processes. The report concludes that the U.S. research effort is vibrant and almost certainly the strongest in the world, though a few other countries are close behind. Among the more important unmet needs, it says, is stronger collaboration with the departments of Education and Labor to boost the supply of scientists and technicians with the skills the sector needs. The report’s concerns about the lack of a federal focus on nanotech health and safety were foreshadowed at a House Science Committee hearing Thursday at which Republicans and Democrats alike took the Bush administration to task over the lack of a plan to learn more about nanotech’s risks. Andrew Maynard, chief science adviser for the Project on Emerging Nanotechnologies, funded in part by the Smithsonian Institution, said the government is spending about $11 million a year on nanotechnology’s potential harms when industry and environmental groups have jointly called for at least $50 million to $100 million a year. Equally important, Maynard said, is the need for a coordinated strategy to spend that money wisely. About 300 consumer products already contain nanoscale ingredients, Maynard said, including several foods and many cosmetics, with little or no research to document their safety. The industry is expected to be worth about $2 trillion by 2014.